Strategies to Minimize the Risk of an Arizona Income Tax Audit. Here are some strategies that may help minimize the risk of a tax audit. The words ‘income tax audit’ strike fear in the hearts of many Arizona residents, sending them scurrying in search of a tax lawyer. The number of Arizona taxpayers that are actually singled out by the Internal Revenue Service for income tax audit is relatively small, but no one wants to find themselves among those who are. While Phoenix tax lawyers tell us there is no guaranteed procedure to avoid an income tax audit, there are some things you can do that may reduce the chances that you will be singled out, such as avoiding some things that raise red flags for the IRS. Being completely honest when you file your tax return will definitely reduce the chances of being singled out for an income tax audit. Being less than truthful about your income is asking to be audited. Even leaving out one small account can bring unwanted attention from the IRS. They already have this information from your financial institutions. Do not attempt to hide income or sums of money. In addition, keep documentation to support every business deduction you claim on your income tax return. Taxpayers frequently attempt to pad their business expenses and the IRS is wise to it. Another common red flag for the IRS is incorrect data. Mathematical errors are both avoidable and easily corrected. Double check that math. The Internal Revenue Service is unlikely to believe you don’t owe taxes simply because you made a mathematical error. It’s a good idea to use a tax preparation software program or a reputable return preparer to help avoid such errors. Many of these programs also contain an audit risk meter that will check your income tax return for the usual red flags and tell you if your risk is high or low. Wait for all W-2s and statements from all financial institutions before filing so you don’t inadvertently leave anything out. Don’t forget child support or any other sources of income. Be certain to correctly report your dependents, the IRS will easily pick up on both you and your ex-spouse claiming the same dependents. Unfortunately, when you file your income tax return as self-employed that puts you in a group often targeted by the IRS. Because being self-employed makes it easier to pad business expenses and to hide income the IRS gives these filings extra attention. Some things that raise extra red flags for the self-employed include reporting business losses for more than three years in a row, and claiming unlikely itemized deductions. Be certain that you understand exactly what constitutes a legitimate deduction. In general, funds spent on the things you need to have or do to make money can be considered deductible. Small business owners should consider hiring a bookkeeper to be certain things are in proper order. There isn’t much you can do about being in a target group. Besides those who are self-employed, other target groups include those with unusually low incomes or above average incomes. In other words, one way to lessen the chances of being scrutinized by the IRS is to blend in. It’s like being back in school, a sloppy, and hard to decipher tax return can draw scrutiny. If at all possible, use a computer to prepare your tax returns. If you don’t have access to a computer, print neatly and legibly. The Internal Revenue Service prefers that your tax returns be prepared on a computer and e-filed. They have found that the rate of errors on paper returns is over 20%, while the rate of errors on computerized returns is less than 1 %. The good news is that a major income tax audit is fairly rare, affecting only 1 to 2% of taxpayers. There are more minor audits, such as a correspondence audit. This is when you receive a notice from the Internal Revenue Service requesting further information about certain data included in your income tax filing. This type of audit is often easily resolved, but if you are feeling anxious it never hurts to retain a tax audit lawyer. More serious types of audit include an in office audit or a field audit. An in office audit requires you to appear at the IRS office with documentation to prove that the information on your tax return is correct. A field audit usually means that IRS auditors come to your business to inspect your books. If you are flagged for an in office audit or a field audit, it is wise to contact an experienced Arizona tax lawyer for the audit. Most taxpayers don’t have the knowledge or ability to represent themselves and would be much safer to be represented by an Arizona lawyer for the tax audit. Although unusual, an income tax audit can carry serious repercussions, including criminal charges, so it’s always prudent to seek the counsel of an Arizona tax lawyer. Should you find yourself in need of income tax audit or tax litigation representation, contact us to schedule a confidential consultation. 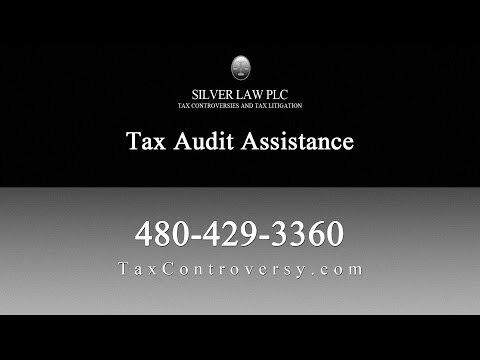 The tax attorneys at Silver Law PLC have over 80 years of experience in virtually every area of tax controversy and litigation, including tax audit representation, audit appeals and both civil and criminal tax litigation. What makes Silver Law PLC unique is that all of our attorneys have previously worked for the Internal Revenue Service as trial attorneys. This gives us a comprehensive understanding of both sides of a tax dispute. We are familiar with how the tax authorities handle different situations and will use our knowledge and expertise to protect your interests.